"Love tastes like rice and beans"
One of the unforgettable things we got to do on this last trip to Haiti was have the first ever "Church in the Ben's" service. The Ben's is the area beside the boys' home where the kids play soccer and basketball. It's a cement area the size of a tennis court and a half. On Sunday we held a church service there. All the orphanage kids were present, and I think a few kids from the neighborhood as well. About half way through worship, I heard the gate rattle, and in walked a proud procession of well-dressed Haitians in single file. It was Pastor Gabriel and his congregation from the Ravine. He is the one who hosts the Ravine feeding every week, and the day before we had invited him to come to Church in the Ben's. Pastor Gabriel's congregation had on their Sunday best -- maybe not fancy by American standards, but for the little those people own, they were dressed to the nines. We are back in the U.S. now, tired and emotionally wrung out. Going to a place like Haiti, which is so different from our home here, cannot help but affect you emotionally. But what is more, I cannot help but give my heart to the kids and leaders of the MDL orphanage, and it is really tough to leave them. I didn't get a chance to blog the last two days we were in Haiti because we were too busy winding down the trip. But I want to tell about a couple of things that stood out in those last few days. Believe it or not, we pigged out on a huge American style Thanksgiving meal yesterday. Just like any other Thanksgiving, I ate way too much food. We went to a party with some local folks the Manasseros know. It was fun! Today David and I held our last Bible study with the leaders of Maison de Lumiere. They are sharp folks and very caring. It has been such an honor to serve them! In the afternoon, we helped the kids paint t-shirts. That was a blast! I especially liked sitting with the littler kids, holding their t-shirt in place so they could paint on it, helping them get the right paintbrush, and wiping the inevitable paint smears off their arms. You will see those t-shirts sometime soon, as we will be selling them in a fundraiser. It was one of those days that you want to live over again just so you can soak up its goodness a little more. And think of it. When we live one of these incredibly good days, we still haven’t seen anything like what we will experience in the age to come, when we are completely open and love flows without restriction. God is good! Highlight #1: Praying for the orphanage leaders. David Jones and I have held a daily Bible study for the leaders of the boys’ and girls’ home. This morning our team gathered, and we spent about 20 minutes praying over the five leaders (Zach, Fritz, Marval, Erta, and Navy). It means a lot to them to receive ministry from missionary teams. The focus of everyone’s attention is the kids, as it should be. That made it even more gratifying to bless the leaders with prayer. I didn't blog last night because in the time we have available for blogging and such, a "God thing" happened. I was sitting on the back porch talking with Morgan Keach and David Jones about life and Haiti and God. About 10:00, Markenson, one of the orphanage graduates and and currently a Maison de Lumiere employee, walked by with his bedding to go sleep up on the roof. (The flat roof of the guest house is a very desireable place to sleep when it is so hot.) As soon as Markenson passed us, a little voice in my head said, "Pray for him." That little voice is a good one to follow. Great day today! We went to church with the Maison de Lumiere folks (Manasseros, staff, and kids). Then it was lunch at the Manasseros' house. Then we spent the afternoon hanging out with the kids. We are here! The team made it to Maison de Lumiere without any incidents. We are exhausted, though. Travel started with a massive check-in procedure (12 people flying from LA with 23 checked bags plus carry-ons). Then we flew the red-eye from LA to New York (it's much better to fly through Florida, but that option was not available to us this time). Our connection between flights was very quick, so we didn't even stop for a cup of coffee in JFK before boarding the plane for Port au Prince. All told, we spent about 15 straight hours in airports. Everyone is turning in early tonight. This is an entirely new thing for the Becks, going as a family on a major mission trip. I'm not sure what to expect. But I know this. If we want to see great things happen in and through us, it helps to put ourselves in situations where need is great. And in Haiti, need is truly great. It is beyond great. It's overwhelming. There is no country in the Western world more wracked with poverty and corruption. Yet Haitians are captivatingly hospitable and receptive. So, not knowing how this trip is going to affect us, here we go. Into the fray. Into the gripping paradox that is Haiti. they will lift you up in their hands, so that you will not strike your foot against a stone" (Ps 91:11-12). Usually we associate God's holiness with his majesty and power. We don't often associate it with love... but Jesus did. Check this out. Exhibit 1: Leviticus 19 is the chapter of that book devoted to the subject of holiness among God's people. I was surprised to discover that most of that chapter is social in nature, meaning that holiness among us is a matter of the quality of our relationships. Read it and see for yourself! --> Holiness is primarily a matter of relationships. Exhibit 2: Jesus stated that the two great commandments were to love God (the Shema from Deut 6:4-5) and love our neighbor as ourselves. Guess where the second commandment is from... Leviticus 19 (19:18 to be exact), the chapter on holiness! So for Jesus, one of the greatest commandments is to love our neighbor as ourselves, and loving our neighbors is an expression of holiness. --> To love our neighbors is to be holy. How important is the incarnation? How important? Consider this. Theologian Charles Gore observed in 1891 that throughout the centuries, the essence of the Christian religion has been faith in the incarnation. That is, Christianity revolves around the conviction that the person of Jesus of Nazareth was God in human flesh. This conviction is so indispensable that if it was to disappear, Christianity as a distinct religion would be gone also. I believe Gore is right. A further question is how does belief in the incarnation affect our daily lives? Here is one way it can: see Jesus as the prototype for the ultimate expression of human life. Imitate Jesus. Take up his way of life. The Bible is a huge book, but in its essence it is really very simple. There is one way we can evaluate the quality of a human life or the collective life of a community of people -- look to see how they (or we) are doing with regard to the Shema. The Shema is the scarlet thread that runs through the whole Bible. 1 Corinthians 7:21 -- Your social standing doesn't matter! Have you ever thought about how much energy we expend jockeying for position in social spheres? We want the next job, income level, house, or car. We think a different appearance will cause people to think more of us. Often jockeying for social position is more subtle, like wanting the right kind of attention from the right people, or protecting how we might look to others, or modifying our circle of friends in order to advance some personal interest. We are prone to swim in a constant swirl of concern about what other people think of us. We receive an unending stream of messages from our culture -- and even within the church -- that our standing in relation to everyone else is to be fought for and protected. We also battle our expectations of ourselves, pushing ourselves to achieve social honor and avoid disrespect or shame. Why do we care if our culture is doubtul about truth? I want to address this question, because it arises out of Steve’s comments on my post about living in an age of BS, and it brings up an important issue: what is the church’s relationship to the world? I am happy to pursue this conversation. Some thoughts on Ps 53… It begins with this familiar line: “Fools say in their heart, ‘There is no God…’” We usually apply this idea to people who do not know God. We lament the foolishness of people who live their lives out of relationship with God. However, I am owning my share of this problem today. In my forgetfulness, I can go through chunks of the day behaving as if I am relatively independent from God. There is an impulse I live with every moment of every day to live as if God doesn’t exist. We all have this impulse. Paul quotes Psalm 53 in his letter to the Romans to support his argument that there is no one on the planet who seeks God on his or her own (Rom 3:12). Left to our own devices, we are all fools. We share the impulse to forget God. And that means we share the impulse to become cannibals. “This book is about love – not the soft, sentimental kind but the strong, spirit-transforming kind. It is about the paradoxical ways we often fear love and the way love uniquely offers release from our deepest fears. It is about the consequences of building the spiritual journey around anything else than surrender to love. And it is about knowing ourselves to be deeply loved by God as the first step in becoming genuinely great lovers of others and God” (p. 11). If you already figure that we live in an age of BS, good news – there is technical support for your view. Harry Frankfurt, professor emeritus of moral philosophy at Princeton University, wrote a biting little book, published in 2005, entitled On Bullsh**. I was given this book by a friend, and I decided to give it a go. I was pleasantly surprised. It is not a joke book. It is classical academic discourse on a cultural phenomenon. I admit, though, that there is a certain childish glee in reading a serious analysis of a word that I am not supposed to use. The opening line states the gist of Dr. Frankfurt’s position: “One of the most salient features of our culture is that there is so much bullsh**.” Okay, now follow along. Frankfurt has a serious point to make. What becomes of the church in a rapidly changing world? I just viewed a video on YouTube called Did You Know 2009. (I am writing this on my blog, and the link won't carry over to Facebook; but a search for "Did You Know 2009" will call up the video.) Very interesting! And overwhelming. The video made me feel anxious. It’s astounding how radically and quickly our world is changing. I couldn’t help but ask, “What becomes of the church in this changing world?” My thought is that the church, if it is going to do well, will get out of big buildings and onto ground level… away from clever programs and into concrete displays of God’s love. The only thing that will cut through the anxiety of disruptive change is what is truly transcendent about the church – God’s love, which has been poured into our hearts through the Holy Spirit (Rom 5:5). Change produces anxiety, and anxiety forces us back to the core of the faith, which is exhibiting the love of Christ in very real, unprogrammed ways. I was reminded of this yesterday as I listened to a song I like very much, "Crooked Teeth" by Death Cab for Cutie. If you don't know Death Cab, they are an indie rock band from Washington. Incidentally, the band's name was taken from a song performed in the Beatles' Magical Mystery Tour movie. Death Cab has grown to immense popularity, with at least one platinum album. A thought for the day... How do we know what love is? The word "love" is tossed around in our culture in so many different ways that it can easily lose any specific content and meaning. Since love is a very important word to us Christians, it is critical that we know what love is. The apostle John gives us two ways to know love. One is that we connect with Jesus through story. We read and digest the stories written about Jesus in the Gospel of John and the other Gospels. For John, God is love, and Jesus is the human face of God's character. 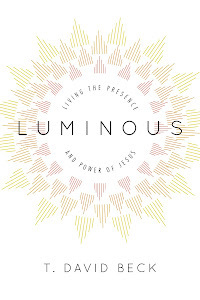 If you want to see what God's love looks like, immerse yourself in the stories about Jesus. The other way is through engaging in love. Love cannot be known in abstraction. It can only be known in the act of loving. As John says, "God is love... Everyone who loves is a child of God and knows God; the unloving know nothing of God" (1 Jn 4:4, 7-8). Sexual orientation -- heredity or environment? Because even a short post about sexual orientation can stir up a lot of feelings, I thought I would add a bit more background to my comments. One book that is very helpful is Sexual Ethics: An Evangelical Perspective by the late Stanley Grenz. Grenz, whom I had the pleasure of sitting down with before he unexpectedly passed away, takes an approach to theology that I find very helpful. Grenz deals with all the major questions in his chapter on homosexuality. Here is one important question he covers: What seems to drive sexual orientation -- heredity or environment? There are two major camps on this issue. One argues that sexual orientation is hereditary. It comes from some combination of genetic makeup, hormonal levels, and the formation of reproductive organs. The consensus among scholars is that genetic makeup alone is not sufficient to determine one's sexual orientation. The subject of human sexuality, especially homosexuality and the gospel, has not particularly been on my mind lately, but I just read a post that quotes New Testament scholar and contemporary sage N.T. Wright on the subject. It's worth reading... here. "Now I appeal to you, brothers and sisters, by the name of our Lord Jesus Christ, that all of you should be in agreement and that there should be no divisions among you, but that you should be united in the same mind and the same purpose" (1:10). I have long had this burning desire to be utterly transformed by God. I don't want to be a better person. I tried that. At a certain point, I realized that God was not going to be impressed by my attempts to be well behaved. What will impress him? Based on what Jesus had to say, I can think of only one thing: love. Now left to my own devices, I am not the most loving person. I am self-centered and rather insensitive to other people. I like to think conceptually. I can tune out people and relationships, and then I wake up wondering why I feel disconnected. Thankfully, this kind of ugliness defines me less than it used to. Slowly I am being transformed into the likeness of Christ. But a taste of transformation only makes me hunger for it all the more. I found out some interesting things about the apostle Paul over the last couple of days' reading in a book by Ben Witherington on 1 & 2 Corinthians. I never appreciated that in order to receive the education he did, Paul had to have been raised in a well-to-do family. Paul was trained in Greco-Roman rhetoric, and he was also educated under Gamaliel, one of the most famous rabbis of his day. Witherington states that Paul's education was in the top 1-2% of his day. Paul came from a wealthy family, and he was well educated. He was also a Roman citizen. Not many Jews enjoyed that status. So, all in all, Paul had a lot of social muscle he could flex. He usually didn't. In fact, in Corinth he chose to take the socially low road of being a tentmaker. This move disappointed some of the more aristocratic Corinthians, who came to see Paul as a disappointment and, ultimately, not really apostolic material. Jesus preached that love is the core of the human response to God (see Matt 22:34-40). 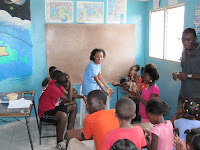 What made Haiti so impactful for me is that I saw this theological truth in the faces of children. The boys and girls in the orphanage have known various degrees of mistreatment, abuse, and abandonment. They are now in an environment where, for the first time, they are saturated with God's love. You can see in their faces the transformation that is taking place as they go from closed to open, hard to soft, begging to giving. They are like flowers that open their petals to receive sunlight. They soak up love like sponges soak up water. They are irresistable for that very reason. "Christianity is the world's great love religion. The Christian God comes to us as love, in love, for love. The Christian God woos us with love and works our transformation through love. Three days a week the Manasseros run a feeding program for kids who live in the area and are regularly undernourished. These kids might or might not eat when they are at home. 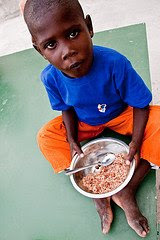 A bowl of rice and beans at the feeding program is the only substantial meal they will get for a couple of days when the next feeding program happens. It is interesting to watch these kids eat. They clearly do not eat for taste. That is, how the food tastes is not important. For them, eating is a job. It gets oddly quiet when the kids are eating. There is no horseplay like you might see at an American elementary school cafeteria. These kids from the ravine are focused. There is a marked intensity to their eating. Nor are there mounds of food to throw away. If a child leaves leftovers, another child eats them. We went to church on Sunday while we were there. I sat in the front row with the Manasseros and some other members of our team. When Pastor John McCool, a man who is as eccentric as Hait itself, started preaching from the second row, I had to turn around to see him. That gave me a chance to look at the people in the congregation. I watched them as they listened to him. I wondered what they were thinking. "How do they live out their faith here in Haiti? What are they hearing right now?" Moments from Haiti... "Thank you, thank you, thank you!" 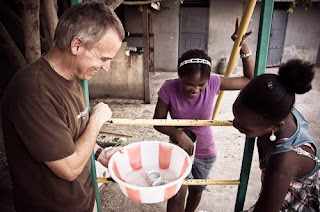 This moment from Haiti is about thankfulness. The first morning we worshiped with the girls, I was both participant and observer. Much of what the girls did was in Creole, so I participated as best I could. In large part, I was just taking it in. One observation I had was that the girls were singing out. When they sing, they do not play it safe. They let their worship go. It's very inspiring! Moments from Haiti... "Do you believe in that cross?" I pulled the cross out from under my shirt and showed it to him. "This is a cross I wear. When I put it on in the morning, I say a prayer." He asked, "Do you believe in that cross?" "Yes, I believe in the cross." He asked again, a little more pointedly, "You believe in that cross?" "Outside and up close" -- does this describe how you relate to the people and the world around you? This phrase really caught my attention. It was mentioned by Dwight Robertson, author of Plan A. He will be teaching a conference at King's Harbor in June. Plan A is about how all of us need to see ourselves as laborers in God's kingdom. As we like to say around KHC, no spectators! "We miss you. Sometimes we get lonely. It doesn't mean we don't want to be there. It's just that God has called us somewhere else." I always knew that missionaries gave up a lot to serve in the way they do. And I understand that they miss the comforts of America. But somehow Mando's quote got through to me in a unique way. They like it here, but they were called there. Going there was an act of obedience. Staying there is surrender. Enduring the pangs of loneliness is ongoing sacrifice. I am not saying that missionaries dislike where they are; only that their separation from the places and the people of their former home is a very real sacrifice. The way the two sisters interact with Jesus in the story (Luke 10) makes us think about how we interact with God in prayer. What Martha and Mary have in common is that both of them are interacting with Jesus. However, they are interacting with him in completely different and symbolic ways. Martha is talking at Jesus. She wants him to do something for her. Note that her cause is right. If fairness had been the only standard for conduct, then Mary should have joined her sister in preparing for the dinner party. However, there are often more important things than fairness. In this case, what was going on between Mary and Jesus was more important than the letter of the law of fairness. Martha was talking at Jesus, but Mary was communing with Jesus. She sat at his feet, hanging on his every word and action. Mary was enjoying a personal connection with Jesus. We can't say the same for Martha. What is the "simple life"? Does this sound familiar? Life feels like it is a train rumbling down the tracks at breakneck speed, and you are holding onto the back of the caboose with your feet flying off the ground. A lot of us feel this way, and that is why conversations frequently pop up about the "simple life." Here is the question. What is the simple life? Does simplicity mean doing less, or does it mean being clear about our priorities? If simplicity means doing less, then we need to attack our schedules. We need to put more "margins" into our lives so we have time to breathe and relate to others. If simplicity means being clear about our priorities, then we need to sit down and examine what we think is important. Our use of time and energy should then reflect our priorities. So which is it? Doing less? Having clear priorities? A little of both? I want to say a few things about a very accessible and simple way to read Scripture together in community. Each week I lead members of the church staff in a time we call "Shabbat" (Sabbath). It is 20 minutes of resting from our labor and enjoying God's presence. There is no "Bible study" here, but I have found it to be an incredibly rich time of interacting with Scripture in a prayerful atmosphere. 1. Read a passage together. We read one chapter a week. In recent months, we have gone through Ruth and Esther, and now we are starting Daniel. Yesterday I was reflecting more on the meaning of the cross. I have been meditating this year on the direct tie between Jesus' willingness to suffer on the cross and God's love for us. Jesus was filled with this love, and that is why he went to the cross. God loves us that much! My further thoughts went to another great paradox of the cross. The power of God is demonstrated nowhere like it is on the cross. God has done a lot of things worth marveling over. Just read through the accounts of the Israelites' liberation from Egypt, and you get a host of large-scale miracles. In Jesus' ministry there were miracles that were large-scale (like the feeding of the 5000) and individual-scale (name any of his healings or exorcisms). The natural response to these miracles is to exclaim, "God is mighty!" 6[Christ Jesus] Who, being in very nature God, did not consider equality with God something to be grasped, 7but emptied himself, taking the very nature of a slave, being made in human likeness. 8And being found in human form, he humbled himself and became obedient to death— even death on a cross! Daniel: a man against culture or a light within culture? I have always viewed Daniel as a hardnosed young man who stood steadfastly against all things Babylonian. After reading the first chapter of Daniel this morning, I am now changing my view of him. He appears not as a man against culture but a light within culture. Daniel was among the first Israelites deported to Babylon, sometime around 600 BCE. It is reported that King Nebuchadnezzar gathered up a group of young Israelite men from the royal family and the nobility. He took these men into the palace for enculteration in the ways of Babylon. He commanded that the young men eat choice foods from the king's own kitchen. However, the story reports that Daniel refused to eat the king's food. Why?